Most people would describe a kangaroo rat as being cute. They have a plump, dumpy little body with large hind legs, large, dorsally placed eyes, and small rounded ears. Kangaroo rats are pale in color with light pastel shades of tan, cream and off-white. There is usually a white band of fur that crosses the hips from the base of the tail. Normal overall length averages 9 to 14 inches for the various species, the largest being banner-tailed kangaroo rats (D. spectabilis). The tail, always longer than the head and body, is covered with fur, and the end is tufted with longer hairs. The long tail undoubtedly acts as a balance when the animal is making long hops. The tracks of a hopping animal show only the marks of the hind feet and the tail. No. of Young: 1-7, 3 avg. Kangaroo rats are found only in the more arid regions of the western and southwestern U.S. Several species occur in all four southwestern deserts. Many of the 22 occur only in California. Ord's kangaroo rat (D. ordii) is the most-wide-ranging and occurs between the Sierra Nevada /Cacscade and Rocky mountains from southern Canada to central Mexico. Two species of the smaller kangaroo mouse (genus Microdipodops) occur in the Great Basin Desert. Kangaroo rats are small, seed-eating rodents of the genus Dipodomys. Kangaroo rats are adapted for survival in an arid environment. Many of the 22 species of kangaroo rats occur only in California. Kangaroo rats have the ability to convert the dry seeds they eat into water. Kangaroo rats neither sweat nor pant like other animals to keep cool. Kangaroo rats have specialized kidneys which allow them to dispose of waste materials with very little output of water. Most kangaroo rats hop on their hind feet, using their tails for balance. There are 22 species of kangaroo rats in North America with many recognized subspecies. The various species of kangaroo rats exhibit numerous differences in physical appearance, adaptations and behavior. The San Joaquin kangaroo rat (D. nitratoide) can be distinguished from other kangaroo rats within its geographic range by the presence of 4 toes on its hind feet; other species in the area have five toes. Merriam's kangaroo rat (D. merriami) is the smallest kangaroo rat in the United States. It has light yellow to dark brown fur on top, with a white underneath. The long tail has a wide white stripe, and a tufted end. These bipedal mammals hop on 4-toed hind feet, using their tails for balance. Adult banner-tailed kangaroo rats (D. spectabilis) molt once a year. Banner-tailed kangaroo rat reproduction occurs year-round. Seeds are collected during seed production months in the spring and fall and transported to underground caches via cheek pouches. Their hind legs and four-toed hind feet are much longer than their forelegs. Males are significantly larger than females. A skin gland located on the back secretes excess oil, which may allow banner tails to swim better, stay drier, and float higher than other small rodents . 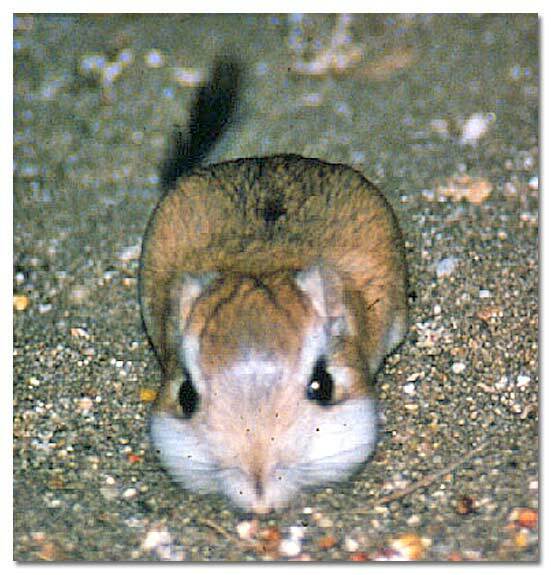 The Texas kangaroo rat (D. elator) is a rare rodent with habitat preferences unusual for a kangaroo rat. It lives on clay soils supporting sparse, short grasses and small, scattered mesquite bushes. The rare and endangered giant kangaroo rat now occurs only in California’s Carrizo Plain. Unlike many other kangaroo rats, D. ingens possesses 5 toes on each hind foot, a white stripe running across its hindquarters, and a white belly. It also has a distinctive tail that is dark colored on the top and bottom with white lines on both sides. 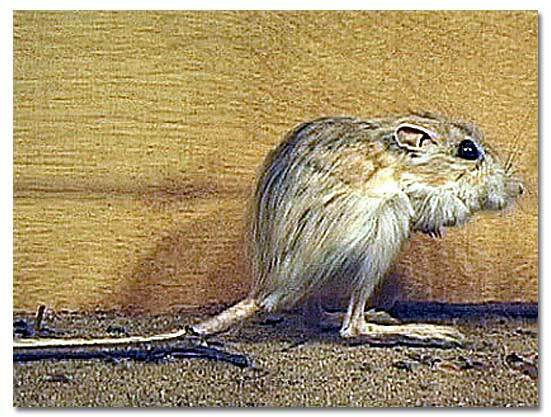 Fresno kangaroo rats (D. nitratoides exilis) collect and carry seeds in fur-lined external cheek pouches. Their diet consists primarily of seeds, but they may also eat some types of green herbaceous vegetation and insects. Ears - Kangaroo rats have small ears that are hairless. Eyes - Most kangaroo rats have large and luminous eyes. Feet - Most kangaroo rats’ hind feet are large with hairy soles that aid in jumping in loose, soft sand. Hind feet are larger than front feet. Some species have 4 toes on hind feet, while others have 5. Short forefeet have strong claws for digging burrows. Kangaroo rats are unique in the animal world because nature has provided them with the ability to survive with very little water and, in the deserts, with no free water at all. They do not store water in their bodies for future use like other animals, yet experiments have shown that their bodies have about the same water content as other animals. In fact, they have the ability to convert the dry seeds they eat into water, and they neither sweat nor pant like other animals to keep cool. They also have specialized kidneys, which allow them to dispose of waste materials with very little output of water. In addition, they spend their days in their burrows where the air is moist and humid. Consequently, they can survive and be quite comfortable in desert climates. No matter how hot and dry it is outside their dens, kangaroo rats come out only at night when it is cool and when there is a minimum of evaporation. Kangaroo rats are solitary animals with a home range of less than one-half acre; the female's home territory is usually smaller than the males. They live in burrows they dig themselves. The burrows go into the ground at an angle, are 1.5 to 3 inches in diameter and shaped like an inverted U, though flat on the bottom. Most kangaroo rats occupy sandy to rocky soils in desert locations with little vegetation. Their burrows enter the ground at an angle. Some prefer well-developed grasslands scattered with heavier soils to support complex burrow systems. Kangaroo rats' primary food is seeds -- mesquite, creosote bush, purslane, ocotillo, and grama grass have been found in their cheek pouches. Some species also eat grasses, succulents, other green vegetation and insects. Most kangaroo rats gather seeds when they are available and cache (store) them for consumption later. Typically, caches are made in small pits on the surface of the soil, scattered over the home range of the individual. The small caches hold only the contents of two cheek pouches. Some species have 2 to 3 litters a year with 1 to 7 offspring, but usually 2 in a litter. At birth, the young are toothless, hairless, wrinkled, with eyes and ears closed; and they show the color pattern of adults in shades of pink. Young males grow faster in terms of mass than young females. As with most animals that have a high reproductive rate, they are short-lived. Some have lived for up to 5 years in captivity. The kangaroo rat's main defense against animal predation is its agility in leaping. Because they are nearly defenseless against their most efficient natural enemies -- kit foxes and snakes -- predation takes a heavy toll. Some kangaroo rats have become a common pest. Some may carry many fleas, which could be passed on to humans. Fleas can be infected with bubonic plague.